My Mom to Public Relations People: Shut Up, You Bozos! More than often, we get dumb press releases here in Gizmodo. This one starts with the following: "MAKE MOM THE ENVY OF THE BLOCK WITH STYLISH WESTINGHOUSE LCD HDTVs." It goes downhill from there. "Flowers and Dinners Are Just Not Enough — Show Your Mom How Special. 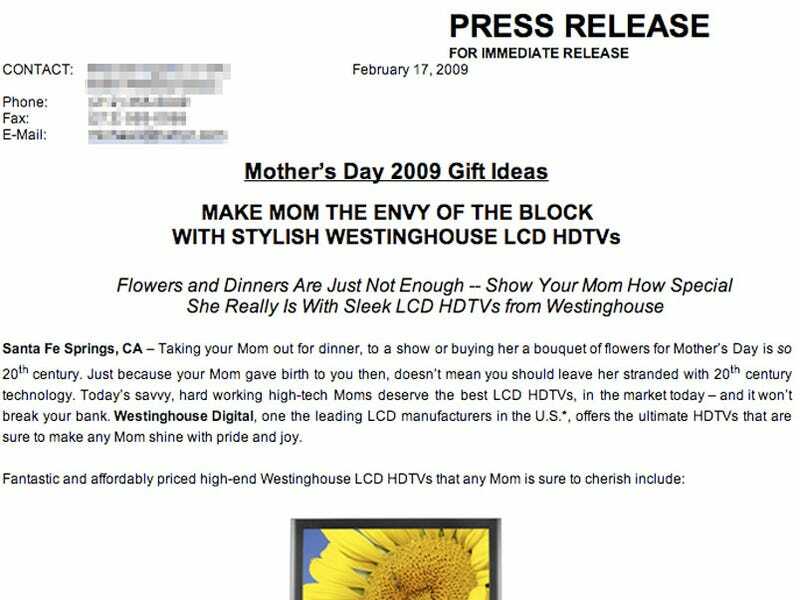 She Really Is With Sleek LCD HDTVs from Westinghouse"
To which, my mom laughs and asks me if these people are on drugs: "Why would I like a TV as a Mother's Day present? Are these people stupid?" As you can see in the capture, the rest of the copy is equally as retarded. Do they really think moms want "sleek" LCD HDTVs? Do some PR people have moms? Maybe they were abandoned under a bridge? Or do they actually hate moms? I want answers, PR people, answers!